The Quilt Gallery has been operating for 21 years. The Quilt Gallery services quilting supplies, quilting classes, craft supplies, scrapbooking supplies, yarns, sewing machines and repair and sewing altering. The Quilt Gallery serves as a quilting class in the winter and in the summer it becomes a display. This is the largest quilt shop in Eastern Canada and receive customers all over the world. Open Mid November - Mid March, closed in the summer when fundraisers and dinners are not being held.The Maple Leaf Curling Club was established in 1976. It services curling for adults and juniors. They also have fundraisers, a lobster dinner, roast beef dinner and Friday lunches during Curling season. In 1993, the Canadian Potato Museum has begun its flourishing business. Prior to becoming the Canadian Potato Museum, it was a community museum opened in 1967. The community museum was a small potato exhibit which held a small gift shop and a tiny kitchen that had no deep fryer. The community museum also shared the building with 2 classrooms. In 1992 construction began to turn the community museum into the Canadian Potato Museum. In the last three years (2013-2015) the potato museum held a potato contest which, to date, has raised $114, 000. In 2014 the museum won the premiere award represented by T.I.A.P.E.I. and CNN rated the Canadian Potato Museum as one of the top 11 food museums. The museum’s services now include food, tourist information, farm tours and an enlarged gift shop. The church services are Sunday mornings. 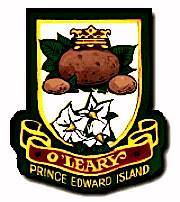 O’Leary Community Sports Centre Inc. Hours of Operation: Open in the Winter. Closed in the Summer. The O’Leary Sports Centre is a sports or recreation centre. It accommodates events such as hockey practice and tournaments, skating, and the Annual Potato Blossom Festival has activities going on within the building during the summer. The Church services are at 9:30 am Sunday mornings. PEI Potato Blossom Festival Inc. The Potato Blossom Festival was established on July 15, 1968. It creates and organizes events for the Potato Blossom Festival each year. Some of the events they include are the Car Show, Gospel Concert, Kid’s Day, Adult Singing Competition, a parade, a Farmer’s Banquet and many more.